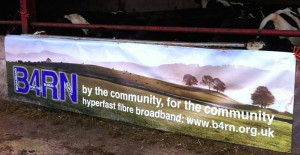 Broadband for the Rural North (B4RN) is a community co-operative created to bring 1 gigabit superfast broadband to properties, regardless of how remote they are. Once installed, this broadband will be the fastest in the UK and will help to reduce the ‘Digital Divide’ between rural and urban areas. This project has come into being, thanks to inhabitants working together, in quite an inspiring feat of social action. They were aware of how important a future-proofed Internet connection would be, to businesses, house prices, and the general prosperity of the area. But there was no company willing to install it. For companies like BT, it just isn’t commercially viable, with costs estimated at £10,000 per property. Whilst the government has stated their intention to connect rural areas with at least a 2Mbs connection, this is just an ambition. B4RN has created an innovative model for ownership, finance and the deployment. This reduces the cost to £1,100 per property. Shares have been sold to people in the community through an enterprise investment scheme – which also offers tax breaks. Or you can earn your shares by volunteering your time to the project. The minimum investment is £100, shares must be held for a three year minimum and they can’t be sold or given to anyone else. Investors from outside the area are able to sponsor a connection. But it is the time, effort and energy of the local people that is really making this economically viable. They are planning, negotiating, digging, publicising…. all for themselves. 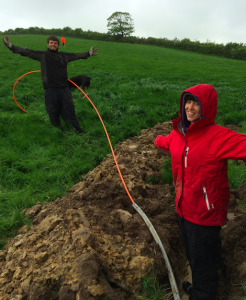 Landowners are letting the cable be run through their land, avoiding costly negotiations with regulatory bodies or re-tarmacking of highways. I got involved last weekend, during a stay at my boyfriend’s mum’s house, in Aughton Lancashire. 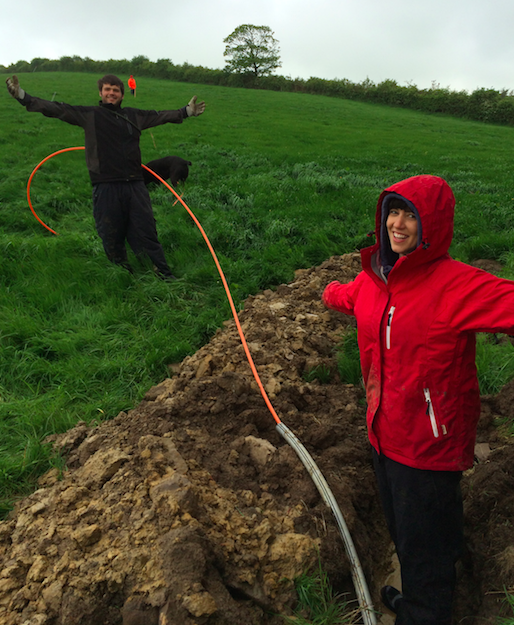 On Saturday morning we were traipsing through fields, in the rain, laying out hundreds of metres of optical fibre. There were a dozen people from the village volunteering, from different generations and livelihoods. They’re clearly excited about what they’re doing and it’s got a huge amount of momentum behind it. It was a unique (if muddy) experience! The project is getting lots of attention, in the UK and beyond, with other communities replicating the programme. Even the Vice President of the European Commission Neelie Kroes has posted a video of support for this grassroots initiative. This is true community collaboration in action! They say if you want something doing properly then it’s worth doing it yourself. So what other local problems could we solve if we work together in a similar way? Aughton, a tiny hamlet in the Lune Valley, is famous for its Pudding Festival held once evry 21 years. Last year was a Pudding year and it drew thousands of people. 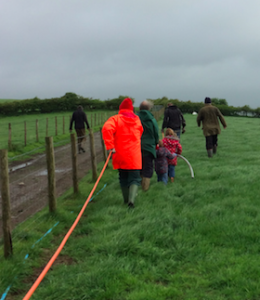 This year is B4RN year and everyone in the village is turning out to get the work done to get connected. Well done the people of Aughton, and a big thank you for all the extra help we’ve had from surrounding villages and further afield- eg Manchester! York! London!